Equinox Boogie 2014 Media Launch, 2nd October 2014, Channel 7. With David McEvoy – Event Organiser, Ramblers Chief Instructor; Dave Morris (UK) – big way formation skydiving coach; and Kirsten Moriarty – Somerset Regional Councillor. Ten News, 3rd April 2014. Totally Wild, Equinox Skydiving & Music Festival 2012. 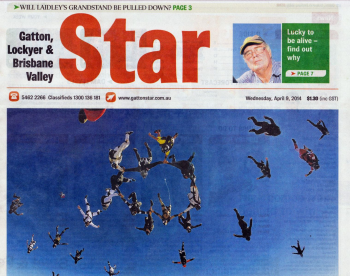 Deena’s leap of faith at Royal Show boosts hostel appeal, 11th April 2013; Toowoomba Chronicle, thechronicle.com.au Jump 4 Joy Fundraiser. 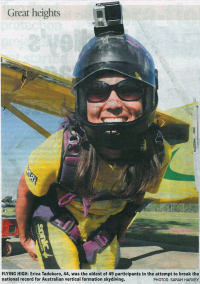 with Ramblers Skydiving Sunshine Coast chief instructor Wayne McLachlan behind her. ABC Radio – Conversation with Richard Fidler. Brodcast date: Wed. 10th April 2013. “Put away the knitting needles, forget the Bingo! Meet the skydiving senior citizens who prove you are never too old to try anything. (…) They are not the usual sky high dare devils. This group is aged between 60 and 74 years old. 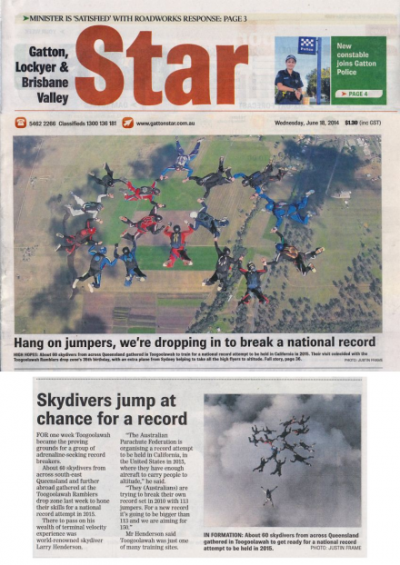 14’000 feet above the town of Toogoolawah, north west of Brisbane, they’ve become the first to complete a sequential formation skydive by people over 60. 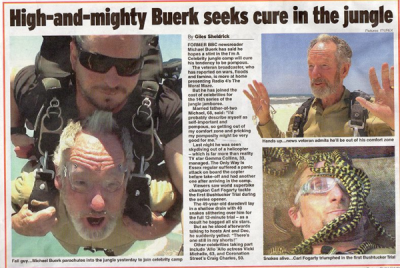 But don’t be fooled by their age, these skydivers have nearly 50’000 jumps and 848 years of life experience between them.” + Interview on site! It’s a long way to the ground… if you wanna rock ‘n’ roll. Over the years, Ramblers have starred in all sorts of TV Shows and Advertisements. We do all our own stunts! 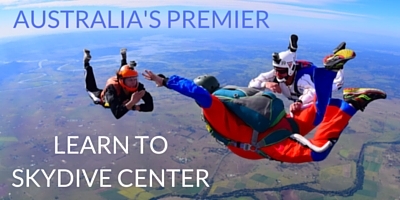 Maybe you have some skydiving ideas for your own movie, advertisement or product? Let’s talk! We’re always up for new ideas and challenges. 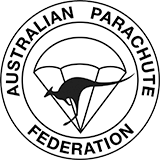 This is the place for your AFF Skydive Course! It was one of the most memorable experiences of my life and in no small part due to the great people at the Toogoolawah dropzone. I highly recommend this place for those considering learning how to throw themselves out of a perfectly good airplane. You won't regret your decision.